From what to how to why, take a look at some of our most common questions. If you still can’t find what you’re looking for get in touch. 01 What is Cart Abandonment? Cart abandonment occurs when a visitor adds item(s) to their online shopping cart, but exits without completing the purchase. The act of abandoning a purchase in the travel industry, a hotel, flight, car rental, etc. The typical difference with a booking abandonment is that as well as selecting a ‘product’ (e.g. type of hotel room) the consumer will also have selected the dates they are interested in. The act of abandoning a quote, subscription, or survey. This is most often seen in the financial industry where the need to submit details to request a quote (for car insurance purposes for example) means the requirement of long forms which lead to abandonment part way through the process. 02 How does the technology work? It’s a combination of smart tech and data algorithms. 03 How do you capture data? We follow best practice guidelines, capturing on field change. As your customers enter their personal data on the page (first name, email address, etc.) then we capture the information when they leave the tab they are typing in. It ensures you get full field information rather than incomplete bits of data. SaleCycle’s CMO Chris Sheen, talks about how Behavioral Marketing can help your business. 04 How do you send the emails? Your choice. We can send it for you, or integrate with your ESP. We’ve got partnerships with all of the world’s leading Email Service Providers so if you want all your emails going through your ESP, then we can plug that in for you. If you’re happy for us to send the emails for you – then we can do that too… and don’t worry, there’s no extra cost! 05 What is your Data Protection Policy? We are custodians and fully compliant. 06 Will our customers mind? No. We have less than a 0.2% unsub rate. The relevancy and customer service approach we recommend ensures that customers respond really positively. It’s the question we get asked the most at SaleCycle, so let’s look at the data. 07 How much could we make? 08 How much does it cost? We’re pretty flexible! Let’s find something that works. We have a number of different options to suit different types of businesses, from fixed price models to performance based – contact us here for a quote. 09 How long does it take to get started? Your dedicated Implementation Consultant will provide an approximate timescale once they have determined the solution we are going to implement for you. For example, how many products, regions and websites. Two products for one region can take six weeks from tag deployment, larger projects will take longer. 10 Why should I use SaleCycle? How and when to cross and up-sell to customers. It’s important to track your own cart abandonment rates! And Google Analytics is a way to do this! But how do you actually use Google Analytics I hear you ask? What can be done to encourage people to give you their email address. What are the factors that make up a great cart abandonment email. How Can Online Retailers Use Surveys? Surveys are one of the quickest ways to find out what matters to customers. We look at how online retailers can use customer surveys, so they can learn about and improve the customer experience. Here we look at some of the ways retailers can use countdown timers. What the Hell Is Microcopy? And How Should Retailers Use It? Grab the popcorn as we’re here to tell you how retailers can use live trends to drive sales. Why Do Abandonment Rates Differ Between Sectors? We look at the differences in online journies that effect conversion rates. What Makes a Successful Ecommerce Loyalty Program? Here we look at how retailers can use a variety of tactics to improve customer retention rates and encourage customers to remain loyal. How Should Online Retailers Handle Returns? In this video we find out how ecommerce sites should deal with returns. Why Are Mobile Conversion Rates Lower Than Desktop? Let’s take a look at why mobile conversion rates lag behind desktop. What is Social Proof and How Can You Use it? Here we explain the concept of social proof, and how brands can use it to their advantage. So what is the difference between User Experience Design (UX) and User Interface Design (UI). Let’s dive deeper into the origins of Black Friday. 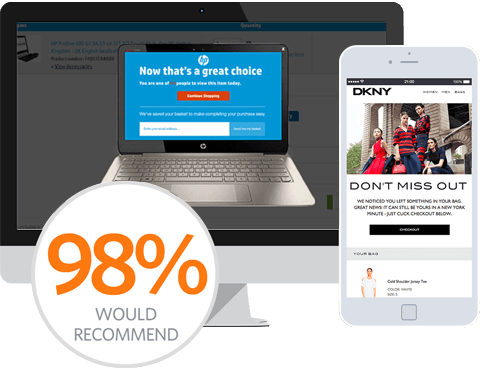 Time to answer the age old question What the heck is Remarketing! What’s the difference between Micro Conversions and Macro Conversions? Let’s talk about the difference between micro and macro conversions, and what they can tell you about your website visitors. See why over 98% of clients would recommend us.